Spring and Summer Salads Are Delicious: You Can Eat Dandelion Greens! to blow it to the wind? I have eaten the green leaves in salads before and decided to revisit their use in my preparations here at 1922 Starkey House. After all, Finger Lakes Restaurant Week is coming up this next week and though I am not a restaurant, I decided to accept the challenge as well. So, as my daughter Rachael, owner of Holistically Haute has coached me about the health benefits of dandelion leaves, I decided to harvest them right from my own backyard (which is not pristine, purposely so) I have begun including these very nutritious greens from the very plant that so many people fight desperately to rid their yards of. I know that dandelion greens can be bitter so I try to find the younger ones that are more tender and tasty. When you combine them with other fresh lettuces and any other salad ingredients that you normally enjoy, they add a delicious dimension to the depth of flavor. I find that enough salt and squeezed lemon are the perfect partners to dandelion greens, a bitter, salty, tart combination. Yum! So, here is a simple recipe that I put together. I really like texture in my salads so I usually add nuts and dried fruits and even sliced fruits like grapes and apples. Rinse the following and arrange on a large platter to serve one to three people. Tear the greens instead of using a chopping knife. This will keep them crisper if you need to store the salad in the fridge for a while. Enjoy!! Your mouth will explode with all the outstanding flavors combined! Check the availability calendar tout suite to pick your getaway vacation dates. 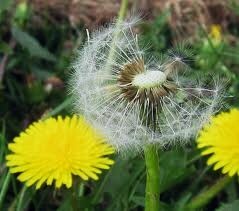 I promise to serve you the Starkey House Dandelion Salad.